Elaine Adair Pieces: Green Bargello is DONE (or is it called Scrappy Trip Around the World?)! Green Bargello is DONE (or is it called Scrappy Trip Around the World?)! Finally, I have this project finished - someone how I thought it would go fast but it seemed to take forever! Must be LIFE interfering, again. Now that I am retired, I find I was MORE productive when working.) 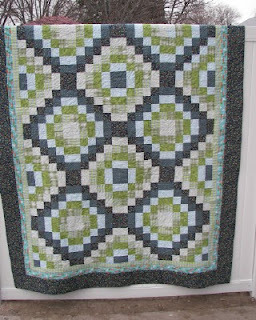 Anyway, "Scrappy Bargellos" are "going around" ala Bonnie Hunter at Quiltville.com and I've wanted to make another one. Just one FQ was purchased. I could have arranged dark blue in the CENTERS of those blocks, but I"m not sure other features would remain constant. This will be a Linus quilt and is waaaay too large for an toddler. 4 x 6 blocks = almost 60 x 80! Yikes, a little kid would get lost under it! It would be good for an older girl perhaps, who likes little "Cutsies." The blocks are 12 inches finished. I LOVE this inner border of rabbits and orange carrots. The quilt NEEDED a little bit of orange - this was perfect, and I just had enough. That dark blue (above) in the border has little red/orange things in it, and it was on sale, so I swooped up 6 yards years ago, thinking it would be a good backing with those little red/orange "flowers". Later I realized the red/orange "flowers" were lady bugs and the idea of ladybugs as a backing did not seem the best choice. Determined to use what I already have, I cut 88 backing squares at 8.5 in. My plan for quilting was this wide sweeping "dwirling" but I had unfortunately forgotten that this sweeping design is great for a long-arm, but I have a Domestic Sewing Machine and with almost every stop and start came a little "glitch" - crooked stitch, driving me crazy - it's difficult to control those glitchy stitches! Lesson learned. 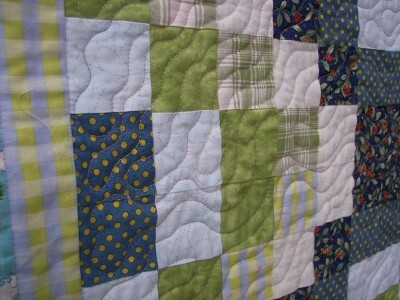 Previous "dwirling" on other quilts was successful when keeping the movements small, and hand-sized. Where was my brain? Looking at the back, at first it looked pretty awful and jumbly, but I resorted to "have faith" approach and in the end is OK. Another handy thing I had forgotten is, when you do these kinds of squares keep all of them either with the grain or across the grain - don't mix them. You can tell because they stretch more cross-grain. They handle better if consistant. I have a few pleats which I believe were caused by carelessness, where I mixed them up. If you have not tried this Scrappy Bargello, you are missing out on fun - your brain will just smile when you make the first one! A nice, summery bargello! And reversible, too. I got a good chuckle from your comment about not using the ladybug fabric for a backing. Elaine- I love your quilt! You are a quilter after my own heart! Once I relaxed and stopped trying to make my quilts so "matchy-matchy", and looked at the overall look of the quilt (instead of each individual fabric scrap), I enjoyed the process so much more!! People are always surprised when they look at my quilts closely and see Pebbles and Bam-Bam as a square next to a floral or batik!!! 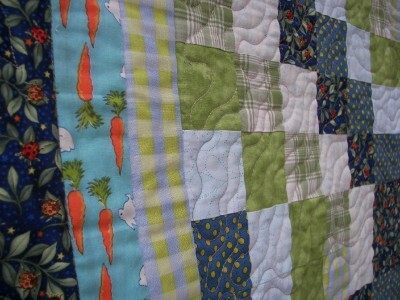 Love your carrot and bunny fabric choice! What a sweet quilt! You always amaze me with how wonderfully you are able to quilt on your DSM. The backing is precious, too. This will make a wonderful donation quilt for an older child or teenager! My guild donates to a children's hospital and they get tons of baby quilts, but not enough larger quilts, so I'm sure it will be appreciated. I know exactly what you mean by the starting & stopping. It is nearly impossible not to have a tiny glitch. But I think it looks great! Great finish Elaine! And I do love a good scrappy back so for me this one rocks! 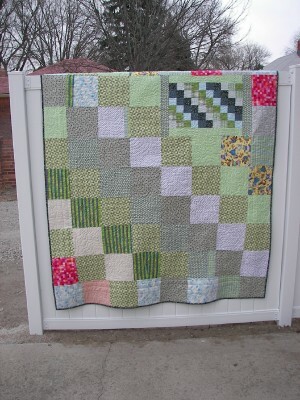 Actually what has been going around are quilts made with Bonnie's "Scrappy Trips" block pattern. She actually has a different (free) pattern that is a "Scrappy Bargello" (scrappy vertical column progression). I had been collecting strips to make one but had been ambivalent about how to control the size so have decided to get on the bandwagon and use my strips for "Scrappy Trips" blocks instead (that is, when I can get to 'em). This way, I can easily control the size by how many blocks I make. Lovely fresh looking quilt, and the backing suits it perfectly. Wow, another great finish. Have you tried pin basting more closely when using a pieced backing to compensate for grain direction? I know I always have trouble with the seams in pieced backs so I tend to over pin. Thanks for sharing. The person that gets this quilt will be thrilled - what fun to have carrots, rabbits and lady bugs!